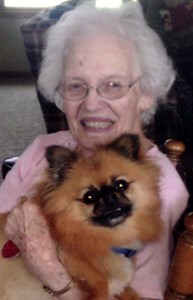 Marilyn N. (Severtson) Mohler, 95, Topeka, passed away Thursday, March 28, 2019. She was born September 27, 1923, in McPherson, Kansas, the daughter of Grove and Zella (Caldwell) Severtson. She graduated from Topeka High School and Clark’s Business College. Prior to her marriage and becoming a homemaker, Marilyn worked at Santa Fe Railroad. She was a member of the Second Presbyterian Church, where she was a past Elder, Deacon and teacher. She was also a past member of Railroader Camp Club, Bulldozer Camp Club, Kaw Valley Community Club, Oakland Forestry Club and Topeka North Outreach Board. Marilyn married Charles R. Mohler on February 19, 1949 in Topeka. He preceded her in death on January 3, 2000. She was also preceded in death by her brother, Marvin Severtson. She is survived by her children, Dennis (Beverly) Mohler, Darlene (Roger) Schweppe; five grandchildren, Jeremy Mohler (Michelle Dreyer), Jaime (Travis) McKinley, Jesse (Jami) Mohler, Justin Schweppe (Janelle) and Derick (Amy) Schweppe; special granddaughter, Kaitlyn Truesdell (Jordan Sester);10 great-grandchildren, Beatrice, Hannah, Kieran, Jillian, Ronan, Brennan, Riley, Kale, JessiLyn and Colton. Funeral services will be 10:30am Tuesday, April 2, 2019 at Parker-Price Cremations, Funerals & Receptions, 245 NW Independence Avenue, Topeka. Interment will follow at Prairie Home Cemetery. Visitation will be held from 6:00 pm until 7:30 pm Monday, April 1, 2019 at the funeral home. Memorial contributions may be made Interim Healthcare of Topeka, 1251 SW Arrowhead Rd Suite 103, Topeka, KS 66604 or Second Presbyterian Church, 210 NW Menninger Rd, Topeka, KS 66617 or Helping Hands Humane Society, 5720 SW 21st St, Topeka, KS 66604. To share a memory of Marilyn or leave a message for her family, please click the Share Memories button above. Add your memories to the guest book of Marilyn Mohler. Dennis condolences for the loss of your mother. Watched the video tribute and couldn't help but think what a beautiful family. To all of the Mohler family, First we were rocked to hear of Doris' death and now, Marilyn, too. We knew and loved both ladies and they will be missed by so many of us. They used to go on all of our Young @ Heart tours and I had known Marilyn from serving on the TNO board and went to elementary school with Doris at Willard. We pray God will comfort you and help you each to find peace. I know we will still enjoy them through the happy memories and pray you will laugh and smile again as you remember, as well. On behalf of the Cathcart family, I want to express sincere sympathy to all of you as you grieve your loss. Marilyn was a kind and gentle person who will be greatly missed. You are in my thoughts and prayers. Dear Dennis, Bev and family, So very sorry to read that your mother passed away. Please know you are in our thoughts and prayers. Love to all of you. Prayers are with each and every one of you for the loss of your mother, and grandmother. Marilyn was such a beautiful lady, always met you with a warm smile, and a great hug. Certainly will be missed by all, until you all meet again. So sorry for your families loss. She lived a long life surrounded by family who loved her.